I’ve been searching for a while for a good docking solution for my X1 Carbon…and I’ve settled on Lenovo’s Thinkpad OneLink Pro dock. I did a lot of searching since I run and wanted it to work with Linux, and I found some outdated and/or inaccurate data from over the past several years. I wanted to add a new data point, and hopefully it will help someone else in a similar situation. Yes, so far it works beautifully. I was worried that it would not be compatible with Linux (more below) but everything worked out of the box. It’s currently driving two Dell 22″ widescreen 1080p monitors. The ethernet and USB ports also all work, as well as the sound. I have speakers connected to the headphone jack (sadly, the front jack is the only one) and my mouse and keyboard are connected to two of the rear-facing USB ports. My only complaint so far is that the headphone jack is the only audio jack, and it’s on the front, so my speakers being plugged in diminish the clean front of the unit. Why did this take so much thought? In a few weeks’ worth of Googling, I couldn’t find anything less than a year old…but I got some mixed reviews. There are two main types of docks available for the X1, the OneLink (regular, and pro, pro being the newer) and a USB dock (essentially a port replicator). I found multiple examples of how the USB dock had problems with Linux. Apparently, the USB dock didn’t simply pass through the video from the existing HDMI and Mini Display Port ports, but had its own hardware inside, which makes some sense given the USB interface. The information that was available to me said that Linux didn’t detect it, and no video could be used on the dock. That information was over a year old, so given the kernel updates that have come out since then, I wasn’t sure if it still held true. The other alternative was the OneLink dock. Why did I choose the OneLink Pro? Some of Lenovo’s notebooks (including the X1 Carbon) have a unique (proprietary, I assume) port that is adjacent to the power supply input. This allows the owner to use a wide, flat cable that is a dock interface as well as a charging input. I was unable to find any information about whether this port worked well with Linux. I decided to take a risk and try out the OneLink pro, mainly due to Amazon’s one-day shipping and generous return policies. My logic was that worst-case scenario, it doesn’t work and I can send it back. Aside from a lack of negative information associated with the OneLink, my other reason for trying it was the fact that it also charges the X1. One of the drawbacks to the USB dock was that you had to plug in at least two cables – one for the interface, and one to charge. And I think the dock itself may have been powered separately too, I’m not sure. So at that point it would be two chargers, then the USB cable for the interface. If I am spending over $100 on a dock, wouldn’t I want to only have to plug in one cable for it to work? Of course the primary feature, or one that I value the most, is the fact that there is only one cable to connect to the notebook. It’s an odd sort of connector, almost oversized. It reminds me of the DB-25 that printers used to use. But, it fits snugly and doesn’t wiggle, which is the first sign that it will hold up well. Another great benefit that most other port replicators don’t have, is a power button. This one has one right on the top. Good to have, and probably a benefit of paying a little bit of a premium to have a Lenovo dock instead of some third party’s port replicator. I didn’t want to have to open the lid, turn on the computer, have the screens detect and arrange displays, close the lid, have the screens detect and re-arrange the displays, etc. With this unit, if my laptop is off, I can plug it in, press the power button, and it’s as if the laptop is just like a tower PC that is connected to my monitors. 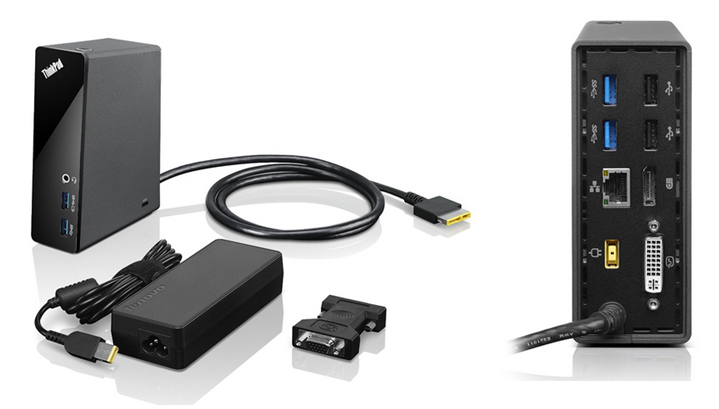 The dock has one DVI port, one Displayport socket, ethernet, a headphone jack, and 6 USB connectors. One of the front connectors is always on for charging devices, and two of the rear connectors are blue for USB 3. This worked out well, since both of my monitors have DVI inputs. I used one of my existing cables as well as one DisplayPort to DVI cable. One of my fears was that every time I connected or disconnected the computer from the dock I would have to re-adjust scaling…but Gnome knew what to do. If the laptop lid is closed, it detects the DPI of the two monitors and doesn’t scale the interface. My face was awash with relief when I didn’t see an overly large interface when I turned the thing on. What impressed me even more is that when I disconnected the dock, and opened the screen, the desktop was scaled at 2X again. And it wasn’t this weird, stuttering adjustment…it just worked. Ten points to Gnome. There is only one drawback in this regard, that I’ve noticed so far. If I have the laptop connected to the dock and I have the screen open, the desktop that is on the native screen isn’t scaled at all…so if you drag a window to that monitor, the interface is woefully small. It is my understanding after some brief Googling (I don’t care enough about this to really research it because two screens is enough for me…for now) that X11 can’t use different DPI or scaling settings for different monitors. Wayland can, but I still use a few applications that don’t play nice with Wayland, so I didn’t delve into that. It’s good enough for me that it works and looks great on the dock with the lid closed, and works and looks great off the dock with the lid open using the built-in screen. Perhaps in a year or so, when Wayland is the default across the board, this won’t be an issue. It would be nice to have the laptop open with my mail client running to stay in view, with the monitors in use for my task at hand. How much desktop resolution will it push? Despite not needing to use the built-in 1440p screen alongside my two 1080p monitors, I was impressed that this little laptop could push all three. So I decided to look into what all it can actually run. Apparently, with two monitors connected, it will push two screens with 1920×1200 resolution in addition to the built-in, 1440p screen. I’m pretty impressed, especially considering this dock assumably simply passes the signal through, meaning that’s what this laptop will do without the dock (it has one HDMI port and one Mini DisplayPort connector). Time will tell if this is as good of a purchase as it feels right now. The Amazon reviews are pretty good, a solid 4 out of 5 stars. However, the reviews on Lenovo’s website are a little less solid. Some mention flickering video, etc. I’ll try to remember to post again about this in a year or so to provide some additional input in terms of the durability of this device. Hi. Thanks for the post! Which gen of X1 do you have? I have the 3rd gen, I believe. Wow. I have Gen2, but can only get one of the outputs to work at once. : /\ What Kernel version are you using? I’m on whatever the Fedora latest is, I think it’s somewhere around 4.10.14, but it’s been working for me since 4.9 or thereabouts, which is when I got the dock. What distro/kernel are you on?